Critical care air transport requires efficiency, compassion, and a willingness to be there when needed – no matter what time of day or night, no matter where in the world the patient might be. The medical transportation team from Air Ambulance Worldwide embodies all of those qualities and more when it comes to serving our clients. Our goal is to help patients with special medical needs get where they need to be as comfortably and safely as possible. 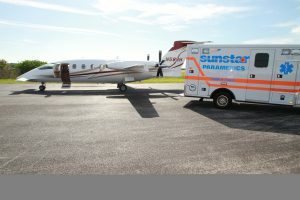 To that end, we have assembled a world class team of flight coordinators, medical personnel, pilots, and insurance specialists who will take all the stress out of a long-distance medical air transport. Critical care air transport also requires medical expertise and experience working with patients for whom travel is a burden and a potential risk. All of our medical staff members have extensive ICU/CCU experience, including our paramedics, nurses, respiratory therapists, physicians, neonatal specialists, pediatric specialists, and more. Our pilots are extremely experienced, and we have earned an ARGUS Gold safety rating as well as EURAMI accreditation, which is only given to mobile air service providers that comply with stringent medical protocols and have exceptional safety records. If you would like more information about our critical care air transport services, please call 727-781-1198 or e-mail us today. Your phone call will be answered 24 hours a day, 7 days a week. We proudly serve patients from the Canada to the Caribbean, United States to the United Kingdom, the European Union and other destinations worldwide.